The smoothness and fineness of cuts are determined by the blade you use on your miter saw. To get the best miter saw blade for use in cutting materials in your project, you need to analyze the specifications﻿﻿ of the blades. However, this might be difficult, because the market has different blades from different manufacturers. Different blades have different designs and are used on different miter saws. S﻿﻿om﻿﻿e blades serve specific purposes, while others are designed to serve general purposes. Here is a buying guide of miter blades to help you in choosing a blade that suits your purpose. You should consider the purpose of your mite saw, to choose the appropriate miter saw blade. In short, to select a good miter blade make you know the materials you will be cutting using the blade. Some blades are multi-purpose while others specifically designed to cut specific types of materials. Before you start any project, ensure the blade you want to purchase can cut the materials you will be using. To easily identify the blade, check the manufacturer, since they have different configurations. Nevertheless, if your projects are flexible, buy more than one blade, since changing blades in most saws is easier. It is a good option instead of depending on a single blade to cut different types of materials. Miter saw blades are of different sizes, and fits in different miter saws. Therefore, make sure you consider the diameter of your miter saw, to avoid using the wrong the blade. The use of a wrong saw leads to problems when trying to cut﻿﻿﻿﻿ using the saw. The regular sizes of miter saws are four, 12inches, 10 inches, 8.5 inches and 7.5 inches. Thus a miter saw blade of 10 inches cannot fit a 12 inches miter blade. If you choose the wrong the blade, it might not fit appropriately in the blade slots, as well as accommodating the cutting range of the saw. However, many miter saws feature a built-in defense from the use of wrong blades. To avoid wastage of your money on the blade, consider the diameter of the saw. Different blades have different specifications, with some having a design that can be used on various saws like radial arms, table saws and miter saws. To ensure the blade you choose has specifications that suits your saw; make sure you check the manual. The specifications of the blade you need use are determined by the make of your saw. The shape of the teeth determines the design of blades of different miter saws. Among the teeth to find on miter saw blades are intricate designed teeth and simple triangular teeth featuring negative or positive rakes. Simple teeth are considered to be effective in wood work, as well as easier to sharpen and maintain. Some of the common designs of blades to find in miter saws are triple chid grind, alternating top bevel, flat top gringo, steep and high alternating top bevel and alternating face and top. The effectiveness of the cutting blade is determined by the number of teeth. Many teeth give a fine and smoother cut, while fewer teeth on a blade make it easier to cut thick materials. Also, medium numbers of teeth are effective for cutting plastic, to avoid the melting of the plastic. However, you should not that the tooth count increases with the increase in blade size. 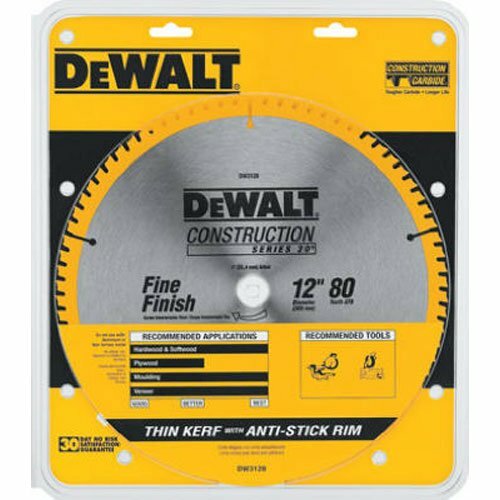 The kerf saw blade is ultra-thin, and it can be used in table and miter saws. The combo pack has two blades that are both 10’’ in diameter, .097’’ kerf; .071’’plate an alternate top bevel and a +5 degree hook angle. The two blades in the pack are DW3106 60 teeth fine blade to provide fine crosscutting in wood composites, plywood and natural wood, and DW3103 32 teeth blade for all general cutting purposes in wood composites, natural wood and plywood. The blades are slim to provide you with even and quick incisions, and with minimum debris. The balancing of the plates is done using a computer to ensure the accuracy is enhanced through reduction of vibration, as well as to give a better finish. The tungsten carbide is durable, thus the true edge is maintained. Besides, the tungsten carbide is tougher, thus stays sharp for a longer duration after sharpening. DEWALT DW3106P5 saw blade features a patent shoulder wedge shoulder, adding extra steel on every back tip, hence maximizing the precision and strength. The miter blade lasts longer. Top-notch blades, as the materials used are strong. Provides fine and smooth cuts. Regular use reduces the sharpness duration of the blade. 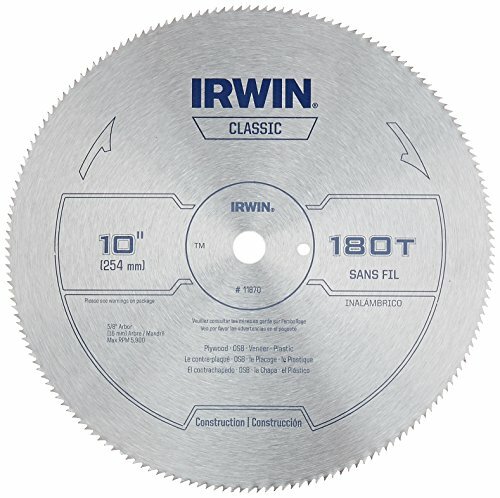 The IRWIN miter circular saw blade is constructed using circular teeth to provide accurate and smooth cuts. 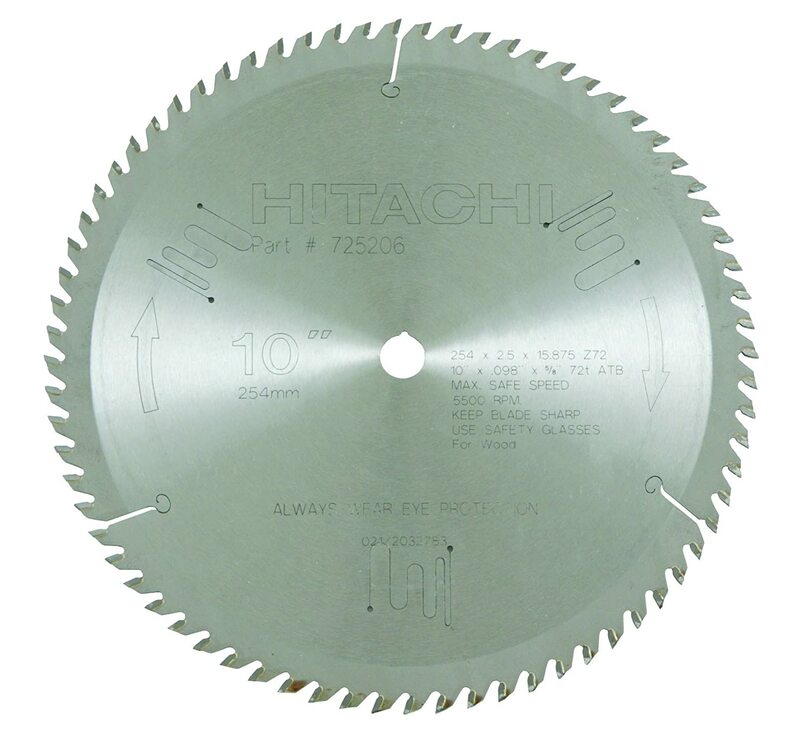 The circular saw blade plate is fully-hardened, to suit its job and last longer. 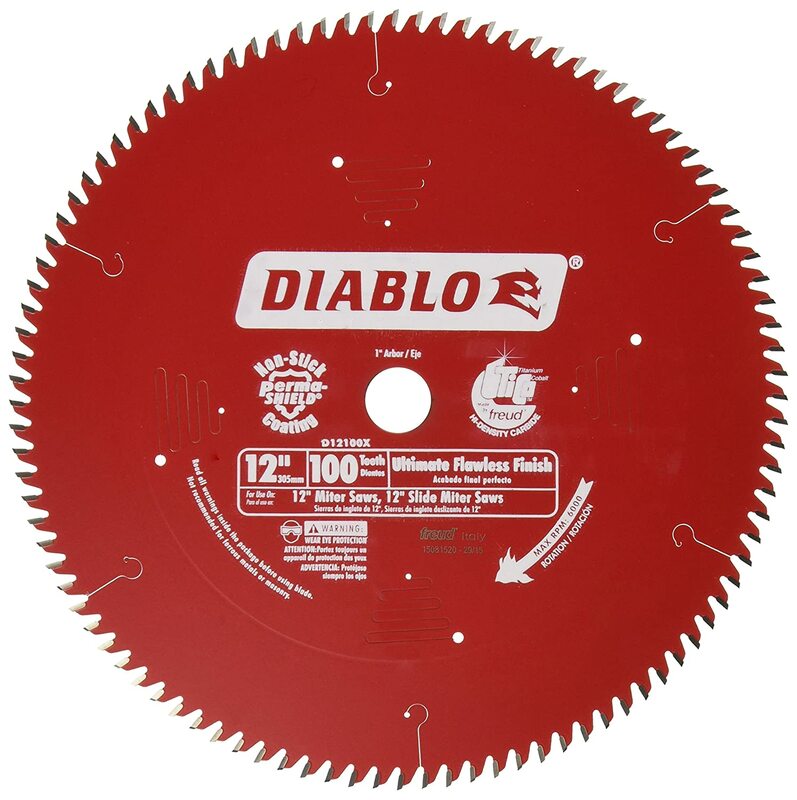 Besides, the miter saw blade is made using high-carbon steel of high-gauge, to ensure the blade has an extended life. The blade is made using steel alloy, weighs 1.7 pounds and its size is 10’’ 180T with a classic style. The blade features circular saw teeth that are precision ground, to make sure the cuts are not only accurate but also smooth. The IRWIN 10’’ 180T plate is fully-hardened, to make it run for long with minimal wear and tear. Therefore, you can use a single plate for a longer duration before replacing. The miter blade is constructed using high-carbon steel alloy with a higher gauge, to increase the durability life of the saw blade. Besides, the gauge of the saw blade is higher to ensure it does not break easily while in use. The length of the blade is 10’’, featuring 180 teeth on the .09’’ kerf for increased incision. Also, a 5/8’’ arbor is featured, making the teeth strong and sharp for long. Great blades but are inexpensive. Works perfectly and remains sharp for long. Cutting is faster, and the cuts are smooth. Not suitable for cutting materials, as it bounces in some. Hitachi 725206 miter saw blade is good for cross-cutting smooth and super-fine finishes in hard and s﻿﻿oft﻿﻿wood floors, laminates, veneer and decorative moldings. The miter blade lasts longer than traditional blades and can be used for years because the teeth are tipped with tungsten carbide, making the alternate bevel blade stronger. Also, the tungsten carbide makes the long lasting tip remain sharper for long. The 10’’ blade offers maximum cutting performance, because it is blazed with 3 metals, strong tungsten carbide, a 5/8’’ ardor and a 0.98’’ kerf featuring 72 teeth. The durability and performance of the blade are highly tested and comes with a 30 days money guarantee. The Hitachi 725206 miter saw blade has a 30-day limited warranty after purchase. The warranty covers the workmanship and defects in materials. Therefore, you can return the﻿﻿ saw blade within 30 days if you feel it does not match its performance description, and if it has some defects. The materials used in the construction of the miter saw blade are stronger, making the blade last longer than traditional blades. Also, the teeth of the blade are tipped with tungsten carbide to make the alternate top bevel suitable for use over repeated years. The miter blade gives smooth cuts. Lasts longer, even in repeated use for years. Works as described, and suitable for molding. The blades are great and cuts clean. Can be returned within 30 days if it gets defects. The quality of the blade is good for the price, but packing is not that pleasing compared to the packing of other similar blades. The Freud D12100X 100tooth blade is specifically used with miter saws. The blade features laser-cut stabilizer vents, which besides stabilizing the blade traps vibration and noise. The shear-face grind design makes it easy to cut materials without wastage of materials, as well as maximizing the performance of the blade. The cutting diameter of the blade is 12 inches, and the material used in the construction is carbide. Freud D12100X blade design features laser-cut stabilizer vents, which works by stabilizing the blade, besides trapping vibration and noise. The blade has a sturdy design with a shear-face grind, making it effortless when cutting materials. Also, the blade gives a reduced amp draw, helping in maximizing the performance of the tool, while reducing the wastage of materials. Additionally, the blade is thin, with a 12 inch diameter, to enhance the incision of the blade. Carbide is the material used in building the blade, making it strong and durable. The high-quality material makes the blade to give a professional finish. Cuts materials without chips, giving the cut edges a smooth finish. Durable because the strong carbide materials. You need to sharpen the blade after some repeated use. 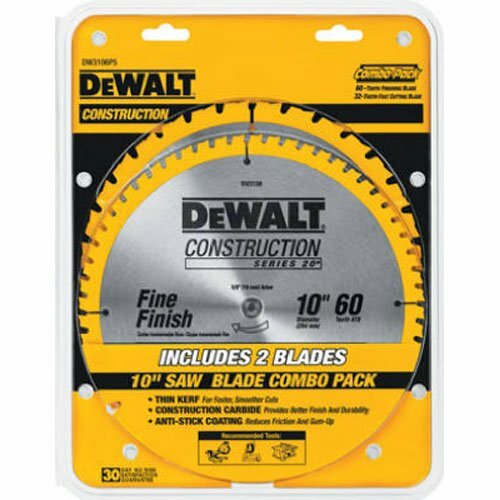 The DEWALT DW3128 series 20 miter saw blade features an inch Arbor. The blades are made using a thin kerf, making it suitable for use with table saws and miter saws. The blade is constructed using carbide material; hence the blade is strong and durable. The blade is used in cross-cutting composites, plywood and natural wood. Additionally, DEWALT DW3128 miter blade saw features an alternate top bevel and a +degree hook angle. 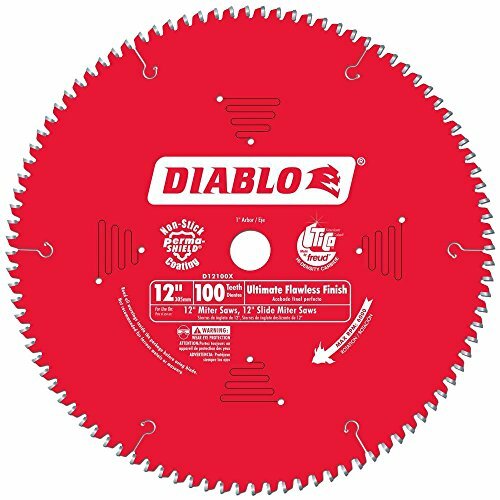 The miter saw blade is made using a high quality carbide material, thus it is strong, durable and of quality. Besides, the blade only dulls after many repeated cuts. Therefore, you can use it for long before sharpening again. The thin kerf and the 80 teeth enable the blade to give fine and smooth cuts. Also, there is reduced wastage of materials, and incision is much easy. The cost of the blade compared to the quality matches the expectation. Definitely, you get the value of your money. The blade is made using carbide material, which is strong and durable. You can use the blade for a longer duration before replacing. Gives smooth and fine cuts. Gives value for your money. Does not require repeated sharpening. Depending on the materials you are cutting, the blade might dull very quickly. Clean the blades after use. Cleaning the blades makes them functional for a longer duration. However, you should be careful when cleaning the blades and when removing the debris since they are sharp and can injure you. Sharpen the blades whenever they are blunt. Nevertheless, you should use the appropriate tools to sharpen and know how to sharpen. Otherwise, you should seek help from an experienced person. Regularly check for breakages, crumbling and wear on the kerf board and replace incase of any breakage and damage. Follow instructions when installing the blade. Store the blade as instructed. Best miter saw blades are made using high-quality materials and are designed well to fit their use. Nevertheless, you should choose the blade according to your purpose. Additionally, you should consider all the factors when purchasing. To avoid replacing within a short duration of time, you should maintain your blade regularly and after use.